It was an unplanned trip of sorts. My usual travel companion is on the ‘family-way’ and couldn’t join. While having dinner at her home, she mentioned 2 lady-friends who were spending their Valentine’s at Coron,Palawan. Having been to Puerto Princessa and El Nido a year ago with them, I immediately booked a plane and joined. Still limping from a right ankle injury, I arrived at Busuanga Airport and was shuttled to Islands View Inn where we were billeted. I took a short nap while waiting for my lady companions to arrive, having boarded an earlier flight. Day 1: The Coron Terrain. The vacation kicked off with an afternoon hike up Mt Tapyas. It was a physical ordeal,with my injury and all, to scale the 750+ steps up the hill but when we got there, a panoramic view of Coron awaits. Mother nature blessed the day with clear skies and allowed us to capture majestic sunset photos. Descending was another challenge since light was fading fast. It was already dark when we reached the foot of the hill. Off to Makinit Hot Springs. The pool was lined with tourists from all over but there was enough room for our entourage. It was a delight to find out that the hot water was salty. This is a first as I am used to the hot springs of Laguna. The water was indeed therapeutic after our ‘exertion’ at Mt. Tapyas. Day 2: Exploring Coron’s underwater treasures. Our tour guide, a native of Coron,welcomed us and gave us a synopsis of what our day-trip will entail. He showed us a catalogue of marine flora & fauna and pointed out which ones we should avoid, lest we are looking for trouble. We arrived first at Kayangan lake, where a short hike uphill is required to get to. A small cave where the Tagbanua’s find shelter during storms, became a subject matter of our photos. Once at the lake, a sense of awe embraces you, seeing the crystal clear turquoise water teeming with small marine life. Our guide didn’t let me plunge into the water without giving me a foot therapy to ease my ankle injury. He had a full 1st aid kit, which I admired. Anxiety took over since it was my first time to snorkel. The gear was so alien to me that I started to hyperventilate while breathing thru the tube. I mustered the little courage I had and went along exploring the lake. The majesty of the underwater landscape just took my breath away. Any fear that was left was replaced with excitement and a sense of wonder. The snorkel alienation was but all gone. Our guide had to coax me out of the lake as we needed to follow our tour itinerary. Still exhilarated from my ‘hydrosperience’, we then proceeded to a barrier reef where we were greeeted with a burst of marine life. The seafloor was so dense with living corals and fishes, you couldn’t keep your eyes fixed on one place. Only in photographs have I seen such wealth the sea holds. Seeing and being able to be amongst them is trully fulfilling. Our mortal bodies required us to pause and have nourishment. We were taken to an island owned by a Tagbanua clan and there we had a banquet of freshly caught seafood. I had to forego the rice as the food portion was too much for the 3 of us! After a hefty meal, off to the Skeleton Wreck and Coral Gardens. Plunging into the deep blue sea, a sense of panic came over me as I am only used to shallow waters where I can still see the bottom. Our guide was very reassuring and attentive that I ignored any negative thoughts one may think of while at sea. Schools and shoals of fishes of all sizes and colors filled up my field of vision. They seem to be oblivious of our presence eventhough we were intruding their domain. To and fro they went, in and out of view. I can feel the water swirling around me from all these movement. The tide was beginning to rise as it was already late afternoon, thus we needed to head back the mainland. Back at our hotel, we had a full massage before dinner. Our guide was also kind enough as to drop by and give me a foot therapy to lessen the swelling. 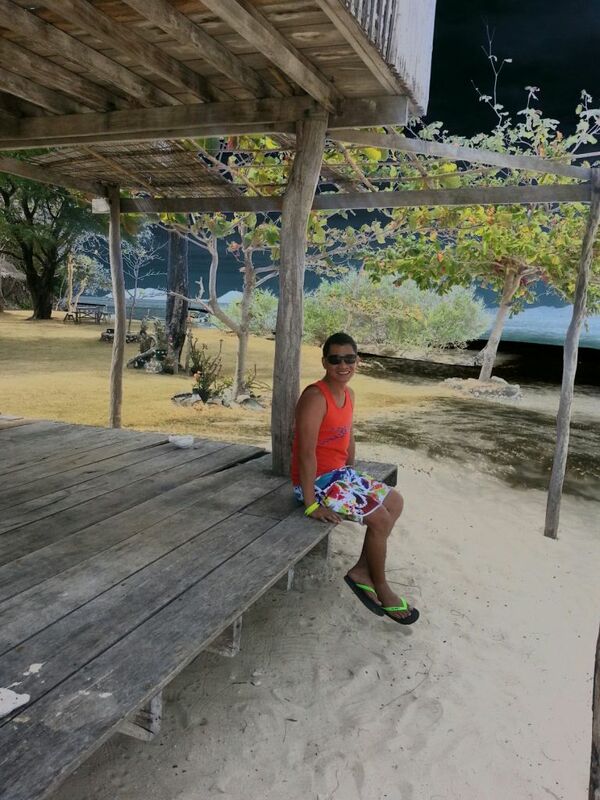 The entire day was dedicated to experiencing the beaches of Coron. There were 2 in our itinerary: Banana and Malcapuya islands. 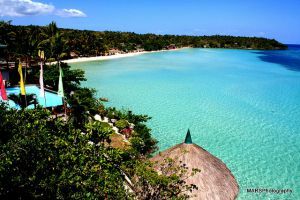 Banana Island is reminiscent of Bantayan in Cebu. Malcapuya, which happens to be owned by Two-seasons Hotel & Resort is reminiscent of the beaches of Zambales but with white coral sands and gentle waves. The resort offered recreational activities such as kiteboarding,jetski, snorkeling. At one edge of the island is a limestone outcrop where you can ascend and get a panoramic view of the surrounding islands. A lot of photographs were taken here as it was very picturesque and almost surreal. Left alone and surrounded by this wonderful creation,I began to utter a short prayer of thanksgiving to the Almighty for blessing me with this wonderful gift. We just spent the entire afternoon sunbathing and clicking away our camera’s until the batteries drained. The day was ended with a sumptuous meal of crabs/fish/ripe mangoes and a refreshing banana split icecream. 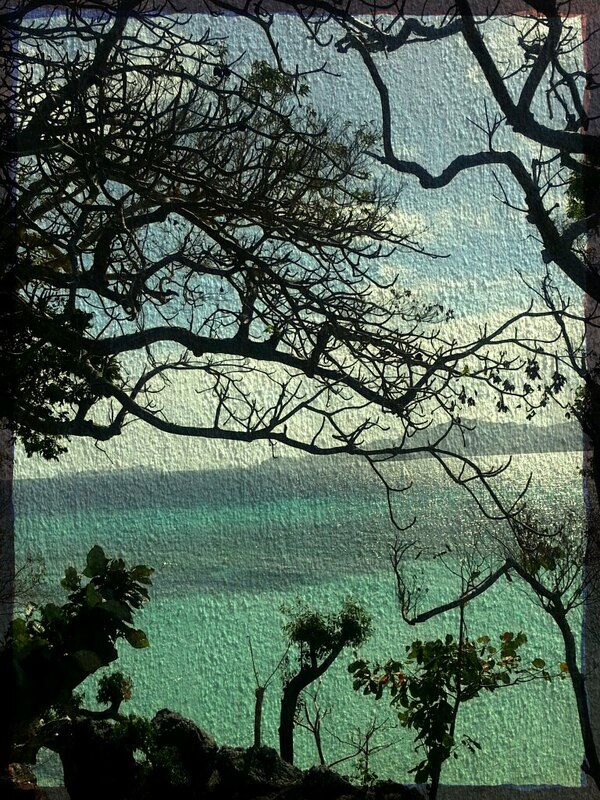 Day 4: Coasts of Busuanga. 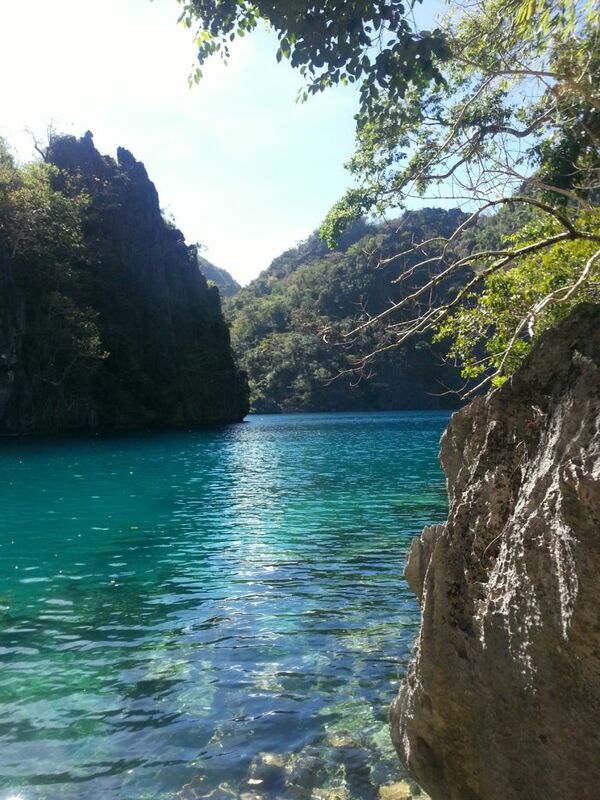 With all return flights to Manila sold out, I had to see my 2 lady cohorts off and had to stay another day in Coron. 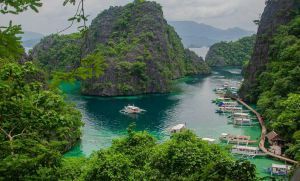 After transferring rooms, I couldn’t allow the day to pass without squeezing all the experience I can extract from Coron. A hotel staff who was off-duty that day, offered to show me the rest of the island by Motorcycle. I rented out a dirt-bike hybrid for P600.00 which is mine for the next 12 hours and began my tour of Busuanga Island. We followed the route going to Calauit which took us 120km and 23 barangays, round-trip It was an activity not many tourists in Coron takes thus I was a bit proud of myself for doing it. We stopped intermitently and took souvenir photos. If it weren’t for the sun beginning to set, we could have reached as far as Calauit Island. We needed to head back as the road to Coron didn’t have lamposts yet and I am a total coward in the dark. 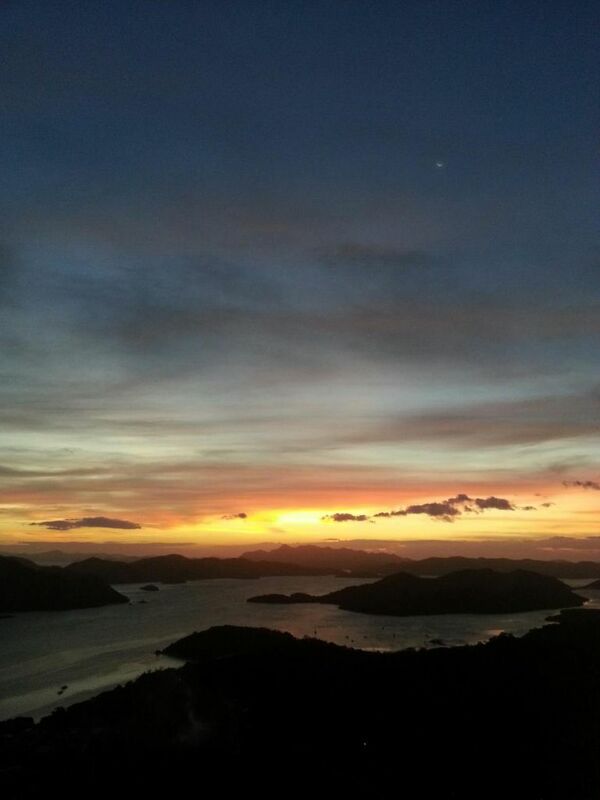 We reached Coron town proper shortly after sunset. I took a quick hot shower as my face and feet are covered with dirt, being ill-prepared for the landtrip, clothing-wise. 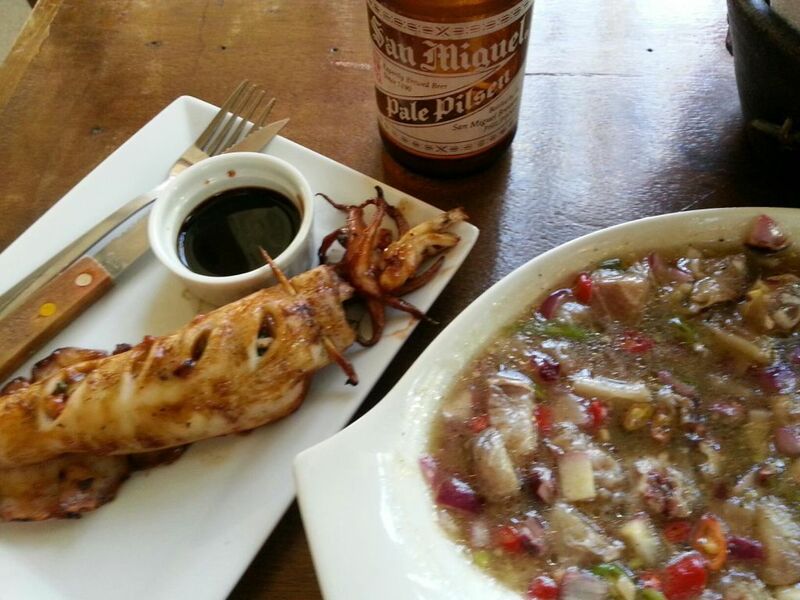 Thankful to my local guide, I invited him and a friend for dinner where we had stuffed squid and kilawing maya-maya plus a bucket of San Mig Lights. Went back to my hotel room past the hour of 10 and dropped like a log. As with all happy experiences, this one reached its end with goodbyes,nice to have met you’s, add me on FB’s, and a flight. Manila at noontime….back to reality. This is an experience I shall truly cherish and encourage everyone to have, whilst our mortal bodies are still able to. 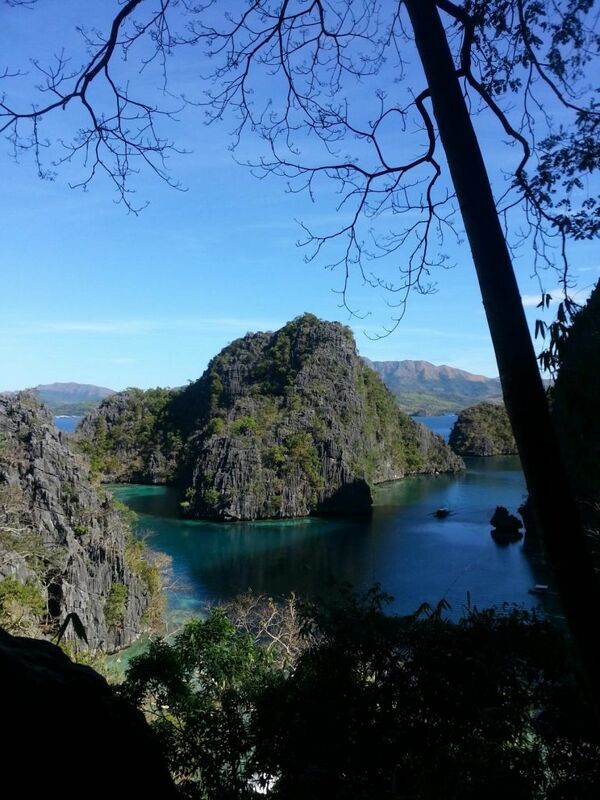 Coron is now #1 in my top destinations in the Philippines.